The Sashastra Seema Bal (SSB) has seized 900 gms of Double Tiger China made Heroin worth Rs. 6 crore and also apprehended a person namely Lal Bahaudur Sardar in connection with the case. 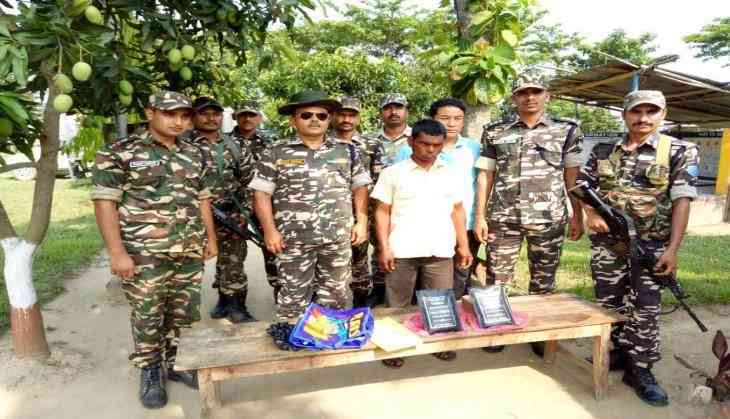 Earlier, a trap was laid on the Sonamani Godam area of Bihar's Araria district in the intervening night of May 17 and 18 and one person was intercepted by the personnel of the SSB. On asking him to stop for frisking, he tried to escape taking advantage of darkness, but the alert troops managed to overpower him and he was apprehended. During the physical search, one plastic carry bag having two packets of Double Tiger China made Heroin was recovered from his possession. He later revealed that he was sent by his handler based in Nepal to hand over the packets to a smuggler based in India at Assisi Ghat Bridge. The apprehended person and seized Double Tiger China made Heroin were handed over to Out Post-Sonamani Godam under the Jogbani Police Station. An investigation into matter is underway.